After President John F. Kennedy’s assassination on November 22, 1963 in Dallas, Texas, the midnight blue Lincoln Continental Limousine he was riding in spent another 13 years as part of the Presidential motorcade. For economic reasons, the limousine had to remain in service in the presidential fleet after the assassination. President Lyndon B. Johnson had it rebuilt and painted black. The limo was reintroduced to the motorcade with a non-removable, bulletproof roof, a steel floor capable of withstanding grenades, a titanium plated trunk, and a more powerful engine. 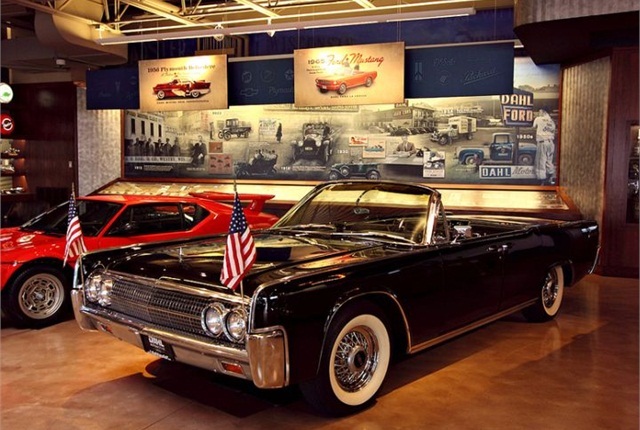 The infamous limousine is now on display at The Henry Ford Museum in Dearborn, Michigan.